At a Clearview Estate tasting at Vivo wine bar in Wellington, I was so spoiled for choice that I couldn’t narrow down my favourite wines to fewer than six! Several more were contenders, and not all of the winery’s range was even there – this is not a common occurrence for me. This kind of dilemma is a rare and wonderful thing! It is a relief to come across wineries you feel you can trust across their range. 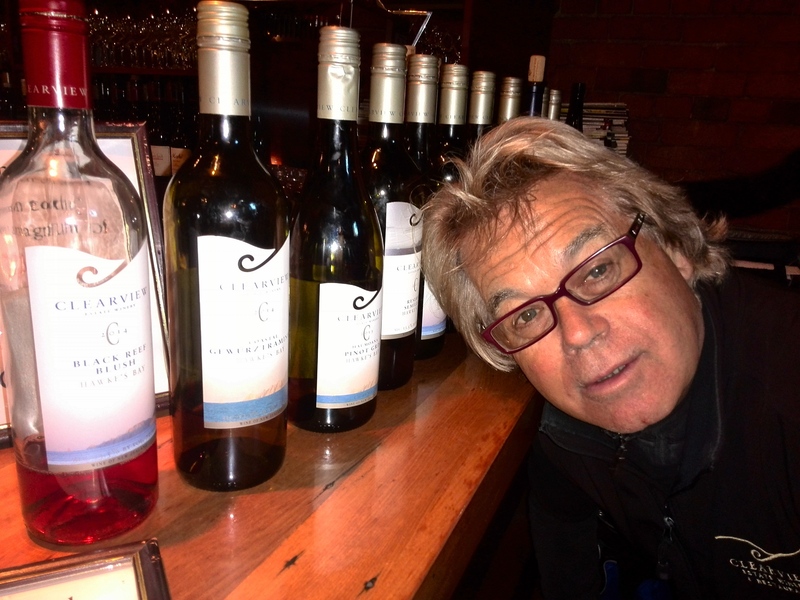 I am often asked – what are your favourite wines – I answer with who my favourite wineries are. If made well, I will love any wine variety or style. Never say never and always be prepared to be surprised. As a not-so-avid fan of rosé I am always ready to be surprised – and a friend recently introduced me to Clearview’s rosé – called Black Reef Blush. This wine is truly delicious, with full rounded red fruit flavours, bursting out of the glass to fill your nose and palate. It is delicious and fresh and satisfying and I would go out of my way to find it. Its secret is not only the cool ferment and expert handling of the winemaker, but the combination of merlot, chambourcin and malbec grape varieties. Chambourcin makes delicious easy drinking red wine, it bursts with flavour. The flavours reminded me of the d’Arenberg Peppermint Paddock sparkling red from McLaren Vale, South Australia, also a standout because of the use of chambourcin (sometimes blended with shiraz). In both cases the winemaking is careful and allows the grapes to speak, and the wines are made with just enough sweetness to allow the fruit to flourish and refresh, but dry enough to finish cleanly and leaving you wanting more. Clearview is renowned for its chardonnay – I discovered this after my friends and I decided that the Reserve Chardonnay was our personal choice of the line-up. We first tried the Te Awanga Chardonnay which was dry and zingy with ripe citrus flavours and a light nuttiness. An elegant but satisfying mouthfeel, easy drinking, with good length and crisp fresh cleansing acid. Next up the ‘iconic powerhouse chardonnay’ as it says on the Clearview website – the 2013 Reserve Chardonnay. Not easily swayed by awards (I trust my own palate more) but the 4.5 stars in the 2014 Winestate Magazine was well earned for this wine. A bold and powerful chardonnay, classy and complex, with rich fruit, French oak influence and a combination of selected yeast strains and wild yeasts allowed to work their magic. The wine is unapologetically luscious on the tongue, creamy, and long. It was beautiful drinking on the night, but can also be cellared out to 2020. As my good friend Raymond Chan (and well respected NZ wine judge and writer) says of this wine: ‘The Clearview Reserve Chardonnay remains one of this country’s best’ – in a country making a large number of impressive chardonnays, that is an achievement. Michael Cooper (NZ wine critic) calls it ‘a hedonist’s delight’ – spot on! The third white? Of course I am biased because I am a self-professed lover of gewürztraminer – if in doubt read about the stunning oily, fragrant, dry and spicy Alsace Hugel gewürztraminer, the complex dry stunner from Johanneshof in Marlborough (Alsace-trained winemakers) and the delightfully different West Brook gewürztraminer from Auckland… This varietal from Clearview was a lighter drier style, more New World than Alsace, with typical notes of Turkish delight and ginger, and just enough sweetness to give a softness on the tongue and making it a very easy drinking wine. Rich yet delicate, light yet very satisfying. My friends were also impressed – my gewürz following is growing one by one! A stunning variety, under-appreciated, offering mind-blowing, surprising, delicious wines. Never discount gewürz, it will surprise and please. The two reds that I tried that really made me excited were the Bordeaux wines – the merlot malbec blend of the 2012 Enigma and the straight malbec of the Two Pinnacles. Both full of fruit and tannin and acid in perfect balance – leave them for a good five years and you will have stunning integrated and balanced wines, bursting with flavour and body. The merlot lifted the Enigma with plums and berries, and soft grained tannins gave a luxurious massage in the mouth – while the malbec was more of a brooder, with that varietal power from the malbec, and damson flavours that I love to find in a malbec. It was dense and dark and with integrated spice, generous and with all the elements to age well. I absolutely loved the Enigma but the Two Pinnacles had just that extra special edge for me. Malbec is a red not often seen in NZ but those that we do see are stunners. Make a mental note when you come across a winery to be trusted. Some of mine are – Hugel in Alsace (France), Langmeil in the Barossa Valley, South Australia, and Yering Station in the Yarra Valley, Victoria (both in Australia), and Gibbston Valley in Otago. I am confident that any wine I buy from these wineries will be in the range of good to amazing. And now – Clearview of Hawke’s Bay with the six stunners described here (and the semillon, viognier and syrah also could have made it onto the list). Many thanks to Vivo who have the largest wine list in Wellington by the glass, with 60 or so to try, plus 600 or more by the bottle! Thanks to Blair of Vivo for your hospitality and to Tim of Clearview for the chance to sample these superb wines. This entry was posted in Chardonnay, Gewurztraminer, New World wine, NZ wine, South Australian wine, Wine varietals and blends and tagged chardonnay, Clearview, Clearview Estate, d'Arenberg, gewurztraminer, Hawke's Bay, malbec, NZ wine, Vivo, Wellington. Bookmark the permalink.